Mick has performed at over 300 functions as a Dame Edna Impersonator for many years. Mick has been described as exciting, sensational and entertaining; hence the term – Ednatainment. Mick’s uncanny resemblance to the iconic Dame Edna is extraordinary. Mick has performed at some of Australia’s Premier Events and he has mixed with some of Australia’s most famous celebrities. Notable celebrities include Eddie McGuire, Shane Warne, David Parkin, Livinia Nixon, Strauchanie, Andy Lee, Hamish Blake, Russell Gilbert and Joffa just to name a few – how fortunate for them! 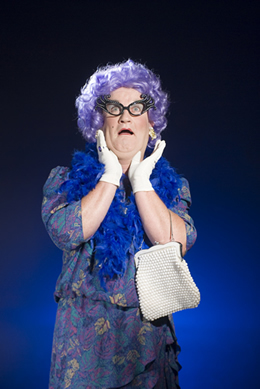 Dame Edna Impersonator Mick O’Neill from Melbourne, performs nationwide and is more than happy to bring ‘Gladdies’ on tour anywhere in Australia. Dame Edna’s late husband Norm wouldn’t have it any other way, God bless his soul! If you want your Event to have the Dame Edna touch, add Australia’s best Dame Edna Impersonator Mick O’Neill, to your Guest List – you won’t be disappointed Possums!